Aksharadhool: A well thought and superbly timed move! A well thought and superbly timed move! Lala Lajpat Rai Road near the Moolchand flyover in posh South Delhi, capital of India, is a busy artery that is usually heavily crowded during morning and evening rush hours. Around 9 AM, 2 days back or on 28th January 2014, a white Honda City car with five people on board, was seen coming down the Moolchand flyover. A gray coloured Maruti WagonR car was seen overtaking and suddenly braking hard and stopping ahead of the Honda city. In an instant reaction,the driver of the luxury sedan braked hard and banged his car into a gray coloured WagonR that had stopped right in front of him without any signal. As happens in any of such road rage incidents, occupants of both the cars came out and an altercation ensued. One of the occupants in the Honda city was Rajesh Kalra, known to police as a big time bookie, who has been part of illegal match fixing scandal of India's biggest commercial cricket competition; India Premier League. As Kalra and other were seen arguing with the occupants of the WagonR car, a white Hyundai Verna arrived at the spot and four men got out. They pointed pistol(s) at Kalra and others and asked them to step aside. Two of them got in the Honda City car and drove away. The others sped away in the Verna car in which they had arrived, leaving behind the damaged Maruti WagonR and original occupants of the Honda city including Kalra. A very slickly conducted crime; but was it done just to steal the Honda city and replace it with a much lower priced WagonR or there was something else to do with it? According to the two phone calls made to the police, the Honda city was being used to carry cash and that too a huge and unimaginable amount and a car stealing crime turned out to be one of the biggest heists ever done on Indian roads. Later, police found out that the both cars used by robbers to carry out the heist, were stolen from different parts of the Capital earlier this month. 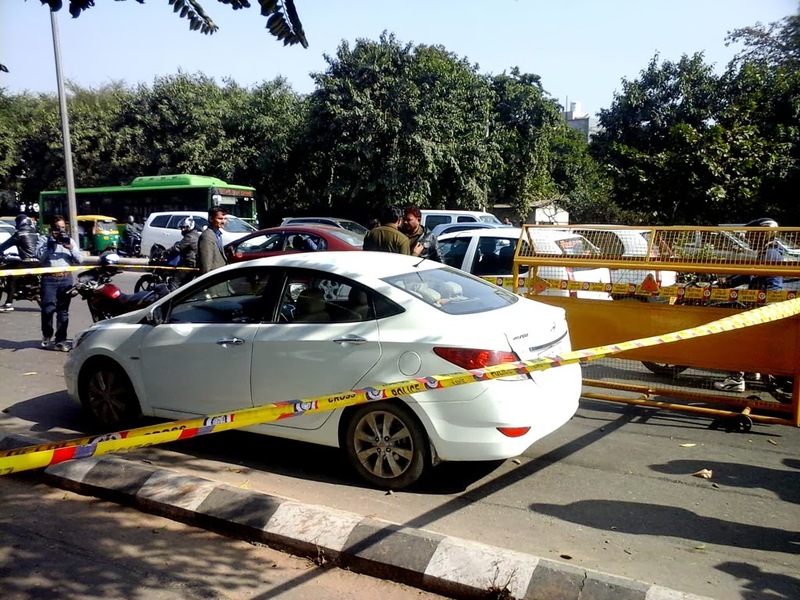 The WagonR that was abandoned at the crime scene was reportedly robbed from its owner in North-West Delhi’s Jahangirpuri, while the Hyundai Verna, owned by a Gurgaon resident, was stolen from West Delhi’s Mundka area. Police found this car abandoned later on the Defence Colony flyover on the same passageway, almost 1.5 km away from the spot. Also found were a couple of fake number plates, an iron rod, a white towel and a packet of red chilli powder. It was very clear to the police, that the heist was clearly a well planned and thought out crime. There were further complications, as the victims of the heist, Rajesh Kalra and others were not forthcoming with the exact amount of the cash they had in the car. According to they first report, Kalra's other associate, Rakesh Kumar had left his house with around Rs. 30 million cash and had reached the Kalra’s office, where they had taken another Rs. 46.9 million from the office and had kept the entire amount in five bags, most of them laptop bags. They had kept the bags in their car and had left for the Karol Bagh area in Delhi in their Honda City car. What was most surprising for the police investigating the crime, was that the victims simply refused to co-operate with them. Rakesh Sharma, has got himself admitted in hospital, claiming low blood pressure. Kalra left the investigations and went home on Tuesday night, promising to return later. Another original occupant of Honda City, who claimed to have owned a chunk of the cash, did not initially appear before the police, but joined the investigation later. Police now say that the victims have confessed to having ferried millions of rupees on several occasions in the past as well. Both Kalra and Ahuja say that aren't sure how much money was being transported that day. But according to police estimates, looted cash could be looted cash could amount to Rs 150-200 millions and may have some foreign exchange notes in it. The reason for which I have narrated this incident here, is not just to describe the crime to my readers, but rather to bring to their attention ridiculously high volume of currency notes that change hands every day, illegally in India. When just one such transaction that has come to light, because of the heist, may be worth 150 to 200 million Rupees, readers can well imagine the total illegal money changing hands in a year. Such kind of transactions using currency notes are popularly known in India as Black transactions because the money involved has not been declared or taxed. According to some estimates, India's underground economy or Black money accounts for 50% of its gross domestic product (GDP), which in 2012, was 1.842 trillion USD, a staggering amount indeed. 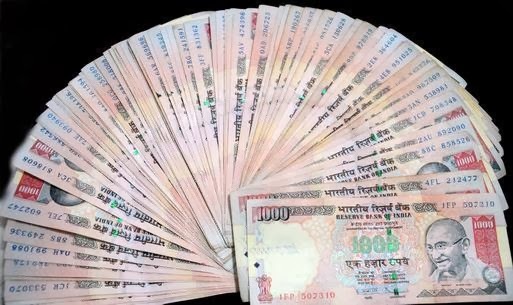 India's monetary controller, Reserve bank of India, has just announced a new policy under which, it will withdraw all currency notes printed prior to 2005 from 31 March 2014. This move has been welcomed by many as an attempt to curb the circulation of "black money" cash that has not been declared or taxed. It is expected to hit currency hoarders and counterfeiters real hard. Reserve Bank of India, started printing the year in which they were printed, on all currency notes printed after 2005.It now says that it has decided to withdraw from circulation, all currency notes issued prior to 2005. From April 1, the public will be required to approach banks for exchanging these notes. Banks will provide exchange facility for these notes until further communication. The notes issued before 2005 would continue to be legal tender though. However, from July 1, those wanting to exchange more than 10 pieces of 500 and 1000 Rupee notes in a bank ,where they do not have an account, will have to provide proof of residence and identity. According to experts, this move by RBI would leave currency hoarders with no option but to liquidate their unaccounted holdings by spending or exchanging them. 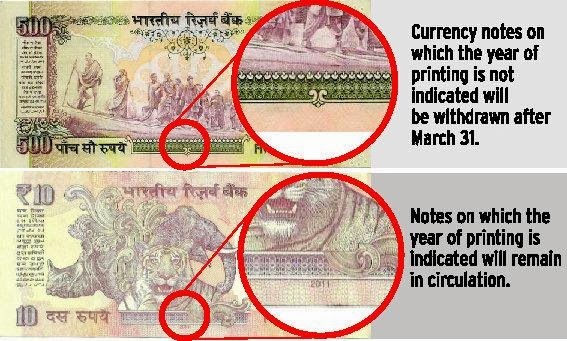 Since the notes brought out in circulation after 2005 have added security features this move is also likely to flush out counterfeit notes, which would be detected in banks. I feel that RBI's scheme is really well thought out. Another factor that is of utmost importance here is the timing. Everyone in India knows that when elections are held in India, highest volumes of Black money get transacted. With elections due in April-may 2014, the timing of the move looks well thought and calculated. Chief Economist at ratings agency CRISIL says: “Money has value as long as it is a medium of exchange and store of value. It loses its value when it ceases to be a medium of exchange. It’s like holding a dead body.’’ Very true! There can be no question therefore that it is an excellent move and it should have the desired effect on the economy.